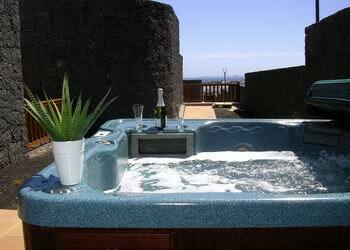 The Vista Lobos villas are located in the upmarket resort of Playa Blanca on Lanzarote’s south coast. Here you will find the island’s best weather, with more sun and higher temperatures than further north. Just 12 minutes walk from the recently reconstructed Playa Flamingo beach and a further 10 minute walk to the town centre, the Vista Lobos villas are in a quiet residential area with a small supermarket and taxi rank just 2/3 minutes walk away. 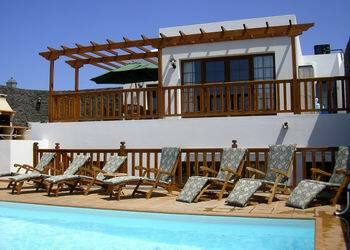 The villas are all privately owned, and many are used as holiday homes by the owners. This means you will benefit from the higher quality of furnishing, equipment, and lower prices generally obtained when booking directly with the villa owner. The villas boast an impressive 220 sq. mtrs. of floor space, which includes a huge main lounge, and incorporate style and modern décor with their unique ambiance and character. All are air-conditioned, have stunning panoramic sea and mountain views, large stone barbecues, and most have Jacuzzi hot tubs and pool tables. A Vista Lobos villa offers the perfect place to enjoy the holiday you’ve looked forward to for so long. Relax in the sun by day and enjoy al fresco dining by night, watching the ferries crossing to Fuerteventura and huge cruise ships passing by. Alternatively, a short walk will take you to some of the finest restaurants the Canaries have to offer. Our office is based on Vista Lobos, so we are on the spot to provide a personal up to date service. Our aim is to ensure you have a wonderful villa holiday in Lanzarote, one you will want to repeat year after year. Your hardest task will be choosing which Vista Lobos Villa to enjoy!